Build your own arcade player! Has development finished on this ? No, but I don't work on it continuously. Right now I'm concentrating on hardware... I'll get back to it eventually. I've been having a play with the FFb settings tonight in the outrun Cfg, on my l2m2 setup as everything seemed to be a bit weak, any how I've upped the settings a bit and it's quite good now,nice and strong. but whenever I'm turning or drifting with a nice centreing spring action from the motor , it seems to block out any other feedback. Like if I run off the road or hit other cars. If the centreing spring action is not being used like in a straight line, if I run off the road or hit another car, the FFb is nice and strong. Here I am, a happy Outrun2 fan playing Coast2coast from the day it's been released. Following your MOD from far, I finally decided to apply your patch and it seems I have some problems on my system (Win7 x64). I'm not far from a perfect experience with your patch, you've done wonderful job and thanks for that, FFB is fantastic with my HAPP device!!! Continue to give us some updates. hi there, firstly have you ticked the box in the fxt.cfg to load straight into sp mode? Yes terminator2k2, I ticked and unticked everything several times with all compatibility settings in win7 file properties. But nothing like a straight launch to SP, just the classic C2C menu. I assume your running the new fxt.exe and not the original outrun2.exe ? Ill turn down the centrespring effects and see what happens, i still get no exaust flames either , even after i upgraded my gpu to a 960. I just like the eye candy, but for some reason it doesnt want to work. I have the overlay and the custom resolution currently working. The only things that don't, are the two I described in my first post (direct load to SP, and clean exit of the game). I've watched over these FXT threads during the last few months and I'm pretty damn impressed man. One thing I've noticed: The 2SP (arcade) menus seem to be Half HD and Half non-HD. I'd love to help out on re-making some artwork in the menus to make it look HD. Would you be able to tell me where the menu files are? I could just cut the buttons out from that screencap, but there may be other higher res shots online, and re-making them will still be okay. EDIT- Just to note, I'm using that OutrunX program you made. Really nice work man. I can still help with art stuff but yeah, it looks better now after disabling 4:3 forcing. Also, how can I modify the artwork on the overlay? I want to change the select button to the gas pedals just like the 2SP arcade says. Have you got MameHooker and DirectX 8? And have you 100% got it running in the background whilst launching FXT? I had the same issues. I just reinstalled MameHooker, rebooted, and ran FXT as Admin in Windows 7 comp mode. if I restart outrun 2 everything is messed up again, the start button flashes with 2 other lights on my vr panel...same in game when you press one of the vr buttons.. I then go through the same process as above and the same thing happens..
That sounds like a parsing error to me. Post the script. what script you want me to post? where do I find it? or is it the Outrun2FXT.ini you want in mamehooker ? Ok nothing looks out of the ordinary, but you might want to open it in word pad or something and "show all characters" to see if a tab or something weird is in there mucking things up. I'm guessing the dll that is erroring out is the ultimarc one. Mine would have some descriptions tacked on. It sounds like the dll is hanging upon exit... it might be on my end and it might be the dlls fault or a combination of the two. I think the next step would be to try each of the commands via mamehooker's test function to see if that is an issue. The ultimarc stuff is tricky because I programmed it via correspondence... I never tested it on the actual hardware. You might also want to try a game in mame that has enough outputs and add those commands... then we can determine if it's a FXT only problem, or a mamehooker problem in general. if it helps, I have the same settings for model 3 games and they work fine with mamehooker and the vr lights. Yeah it's probably something fxt specific then. Why don't you try adding an ultimarc kill command in the mamestop section. It might just need reset. I also noticed when I tried messing around with it earlier this evening, as soon as you go into the game with the car on the start line ( I suppose this is because this is when the vr lights start working) the same error pops up there aswell. That almost sounds like an invalid value is being passed on. Mamehooker should have error checking for that though. Most of that behavior is planned or already implemented. That certainly sounds like an invalid value is being passed, and going between screens would be when that's most likely to happen. Supermodel is handling the outputs for supermodel... it works just like mame. My guess is the lights you are using are leds, which have a stark on/off, while the game used lamps, which fade out when turned off due to the use of a transistor. Ramjet's stuff works better because he most likely tested with leds when he wrote the timing. Hey can you confirm something for me? It looks like the last version I released had the outputs borked. If you open mamehookers debug window you'll see the view lamps getting weird data.... like values greater than 1, ect. I fixed this. It was because I had added many new outputs and I forgot to re-order the output ID numbers. So that might have been your issue. I'm getting Outrun FXT ready to be copied over to a new folder for the Offroad Thunder FXT, so I'm squashing bugs left and right and sprucing things up in general. So now is as good a time as any to do an interim release. vr2 output changes with what view mode you have - 1 to 4 shouldn't this be on the vr view ? also as I go through the vr buttons, it shows more than 1 output being on, and sometimes the start button being on aswell. Yeah that's what I'm talking about. It was registered with mamehooker at one id and data is being sent with another, so mamehooker is getting confused. I've already fixed the issue, it's just a matter of doing a new release. Most likely this is what was causing the issue with your pacdrive. if you have a version ready for release...do you want me to test the lights first? Yeah I'll send it over tonight, but it isn't quite done yet. I'm adding some different blink patterns for the menus and adding a single button lamp mode. Ok it might be another day or so. I'm finding more bugs to squash... might as well do it now. I'm a bit behind the times with all the recent updates in this, but I've just installed the latest beta on both my PCs because I'm going to be doing some multiplayer tonight. This has reminded me that I wasn't ever able to figure out how to do the music swaps, even though in theory it shouldn't be that taxing. I've put all the bonus tracks in the sound folder, I've got overlays enabled, I press brake on a song that doesn't have an alternative (like Nightflight or Radiation) and nothing happens. What axis is your brake mapped to? I found on my rig that I'm having an issue with it as well. For whatever reason I have to press gas to get it to change. I've got a new version that I already passed along to t2k2 that I want to work on a bit more before release.... I'll see if I can fix it somehow. Well I think the issue is I assumed the value I'm reading was static... in other words brake is always the same value, but now I'm thinking if you remap your joystick the value changes in memory. I'll figure out a way to fix that.... perhaps having you press a keyboard key while holding down the brake to save the setting or something. Howard, sounds like you're on the case with sorting this out, but FWIW, My brake is assigned to Axis Z. 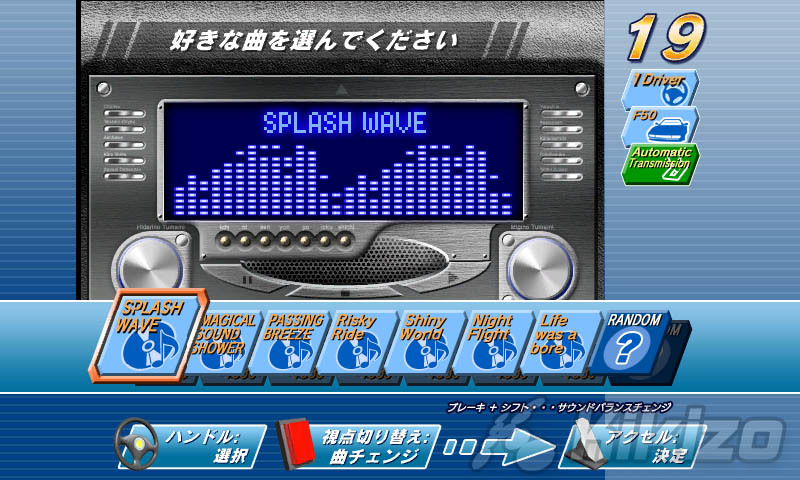 If I press the gas pedal it swaps out the tunes the way it would normally if you press the F2 key (i.e going from Magical Sound Shower, to the 1986 version to the Euro remix) but not the Japan bonus stuff that I've added to the sound folder. When this is working normally, does the name of the added bonus music appear in the overlay when you press the brake pedal? If you're pressing the brake on a song that doesn't have an alt version, how do you know which actual song you're selecting? The font normaly changes when you press the break on a song with a alternate song, and im sure it changes to the new name aswell....ive not been able to get magical sound shower euro mix working, I assumed for instance, you either have the original magical sound shower or the euro mix, you cant have both aswell as the 1986 version. I could be wrong but that's what I assume. Page created in 0.221 seconds with 62 queries.